Our models have been very consistent the past few days showing the largest weather pattern change we’ve seen in 7 months. As mentioned NUMEROUS times since March or so, the West Coast has been dominated by some sort of cool upper-level troughing. During the last half of August this trough has mostly disappeared (not counting this first 3 days of this work week of course). That allowed temperatures to average out to “normal” for this month for the first time since January. But now it appears a strong upper-level ridge will build over us and stick around for quite a while. Most impressive is that all models have the same pattern change, so we have quite high confidence in the big change. The obvious question would be “didn’t we have major pattern change give us 96 degrees about two weeks ago?“. We almost did, but the ridging was a bit to our east, and notice the real hot weather only lasted a couple of days at most. So then the next question might be “just how hot is it going to get?“. The short answer is that it probably won’t get much above 90 degrees in the next 6-7 days; partially due to the much longer nights and lower sun angle in early September compared to July and the first half of August. And 90 degrees in September sure doesn’t feel like 90 in midsummer. That’s due to that lower sun angle and long nights as well. Temperatures rise and fall quickly in early Fall plus nights are significantly cooler as well. I should point out we expect it to be very dry (low relative humidity) during this warm spell. Some models are showing an even warmer pattern that would push us up into record warm territory next Wednesday or Thursday, but that’s a ways off. The main point is that we have an extended period of very warm or hot September weather on tap, probably 7 days or more. That includes a cloudless Labor Day Weekend in just about the entire Pacific Northwest. There may be some low clouds at the ocean beaches by Monday, otherwise cloudless and warm there Saturday and Sunday too. There are some much higher resolution satellite pictures available each day that you may not be aware of. The Aqua and Terra satellites have been sending these images for maybe 8-10 years. The drawback is that they are often several hours old and you only get one or two images each day. But we can see quite a bit more detail than with the GOES satellites… such as the image below. This is from the Terra satellite at midday yesterday. 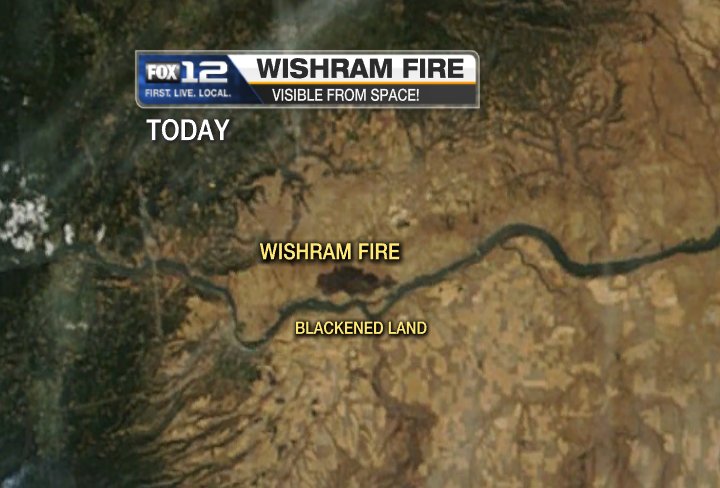 Notice the Wishram fire is just getting going with lots of thin smoke stream up through the east end of the Columbia River Gorge. You can click on the image for a better view of course. 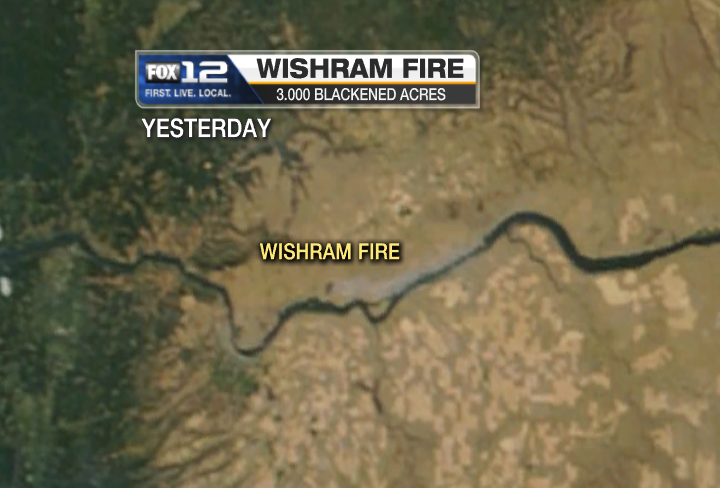 Now look at this afternoon’s image: Check out the 3,000+ acres burned in one day! Quite impressive, it shows up well against the bright brown of the dry vegetation eastside. Also notice the fire appears to be well under control with no smoke visible. Too bad we don’t have 15 minute imagery at this resolution; wouldn’t that be nice? Luckily the firefighters working fires burning around Mt. Hood and on the Warm Springs Reservation will have cool temps and relatively high relative humidity to deal with. Gusty west wind will continue though. No changes in the forecast the next 7+ days. 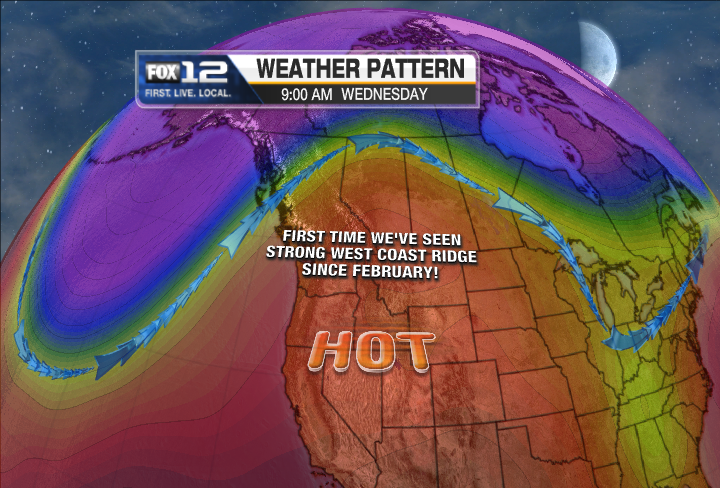 A cool trough over us now moves east Thursday, followed by another one Friday which will be farther to the north. So a slow warming Thursday and Friday. Models show strong offshore flow late Friday night and all day Saturday, so we’ve made that the warmest day of the weekend. 850mb temps say we COULD get above 90 degrees, depending on the model. They also all agree on unusually warm weather through the first week of September. For the first time since January (7 months! ), an upper level ridge is forecast to sit over the West Coast for at least several days. The good news is that it’s happening in early September and not late July. So instead of 60-65 degree nights it’ll be 50-55 degrees for most of us. We’ve only got 2 more days to go this month and it looks like August will end up right around average. That’s due to cooler than average temps the first part of the month, then a very warm 2nd half of the month. Now this workweek appears to be quite chilly with marine air dominating west of the Cascades. That cooling is just in time since all the lightning late last week started dozens (maybe hundreds) of fires across central and north central Oregon. The latest (the Dollar Lake fire) flared up the last couple of days and is now burning southwest of Laurance Lake and a few miles north of the summit of Mt. Hood. A huge plume of smoke was towering over the Upper Hood River Valley all day today. I see temperatures at the 5,000′ elevation have plummeted into the 40’s this evening up there as a cooler airmass moves in. It’ll be here through Thursday, and maybe Friday, so firefighters have plenty of time to get caught up. And I don’t see any lightning pattern either. Starting this weekend, we appear to be headed into a very warm early Fall pattern with easterly surface flow at times and a dry airmass. This is one of my favorite weather patterns of the year. It’s not uncommon to have a crisp low around 45-50 and a high of 90; a huge daily range due to the dry air and long nights with a warm airmass overhead 24 hours a day. We went somewhat conservative with our 7 Day forecast due to models uncertainty about placement of a thermal trough. For example one run of the GFS showed a strong thermal trough west of the Cascades for quite a few days beginning Saturday. But the ECMWF showed weak onshore flow, or at least a loss of offshore flow, Sunday-Monday. That can make a huge difference in high temperatures. You need easterly flow at the surface to get hot after the 1st of September. Nice Light Show and Sprinkles This A.M.
Quite a light show to wake up to this morning 3:00-5:00am. I was awakened by big splats of rain about 4:15am and saw almost continous lightning at times to the south and east. Only a few rumbles here on the far eastside though. We ALMOST were camping at Timothy Lake last night, which must have been quite a loud place early this morning…check out the almost solid yellow strikes around and just south of Mt. Hood! Each of those “+” marks is a cloud to ground strike (or ground to cloud of course). 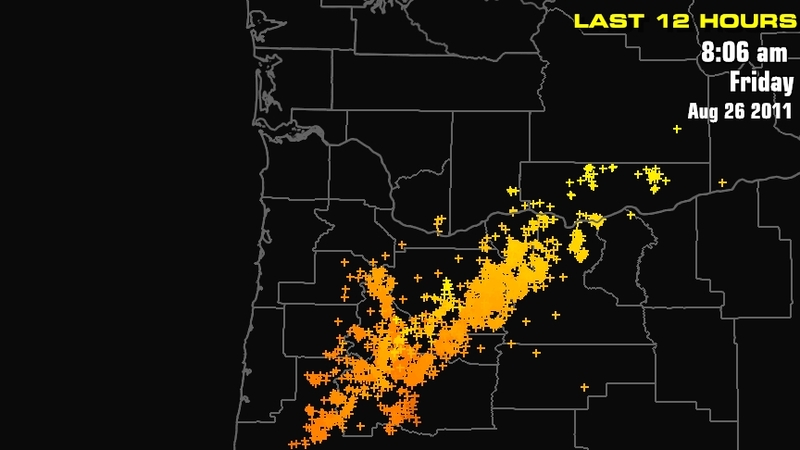 Here’s a much larger and close in lightning strike map for the Portland Metro Area: Click on the map…it’s REALLY big! 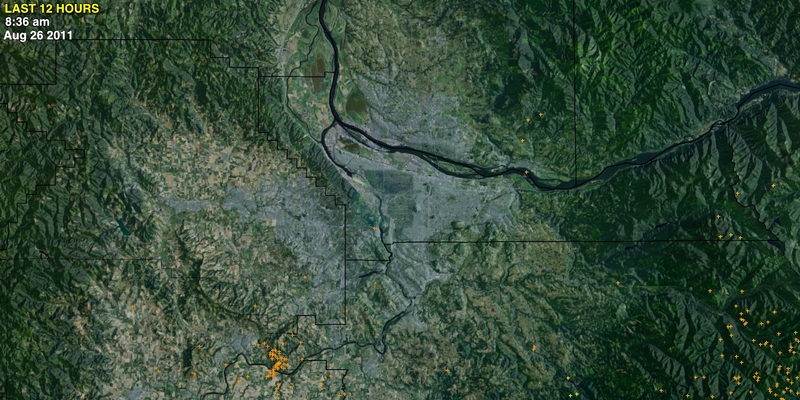 But notice there was one spot in the metro area that had quite a bit of action: between Newberg and Wilsonville within a few miles of the Willamette River. It’s interesting that the UW-WRF model showed the convection in the right place and the right time. Here’s the 5am forecast precipitation from the 00z run last night. It shows accumulating precipitation from 2-5am in about the right spot doesn’t it? Our RPM model did not show any convection. Well, it was fun while it lasted, but now that has moved on and we have another warm and sunny day on tap. That is one benefit of the very warm and humid weather; much better chance for thunderstorm activitiy. The cooler weather returns just in time for school to start (for my kids at least) and September next week. A quick check-in this afternoon. Today is the 5th day with above average temperatures here in Portland; it’s the first time we’ve had 5 consecutive warmer than average days since early March! It shows how unusually cool spring and the first half of summer was. The payoff has been the last 10 days as we’ve made quite a turnaround into typical summer conditions. In fact this morning’s and yesterday morning’s lows (64 & 65 degrees) were the warmest of the summer, due to quite a bit of moisture in the air. It sure hasn’t been extremely humid even for us, but the air definitely has a “heavier” feel to it. I see thunderstorms firing up over the Cascades and even some lightning strikes well offshore late this morning and into the afternoon. We sure have the warm and humid conditions that make it “feel thundery”. 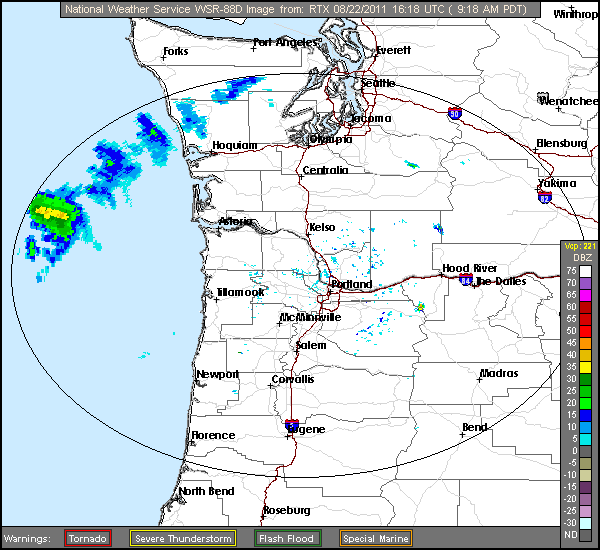 There is a very obvious upper level disturbance near Brookings at this hour, and it’s headed right up through Northern Oregon and into Washington overnight. With nice lifting, lots of moisture to work with, and a warm airmass (no cool marine air to stabilize things), this CAN be a great setup for an overnight thunderstorms. The curious thing is…none of the mesoscale models show anything to “write home about” the next 24 hours. Generally they do quite well with this pattern, although a similar setup on Monday, July 25th gave us the surprise morning thunderstorms. I would prefer to see a more southerly to southeasterly flow to give us nocturnal thunderstorms as opposed to the current south-southwest direction, but those late July storms came out of the southwest as the disturbance moved overhead. Hopefully we will see some excitement west side tonight since I’m not working this week and I can relax/enjoy from home like everyone else! Otherwise enjoy the “sultry summer weather” since we’ll be back to the usual programming (clouds and cool) in no time at all I’m sure…September is only 1 week away. I got this from Cliff Mass’s blog this morning (via Pappoose in Scappoose in the comments on the previous post). Check out the difference the new radar (not operational yet) makes up on the Washingotn Coast. There is a very juicy front offshore. 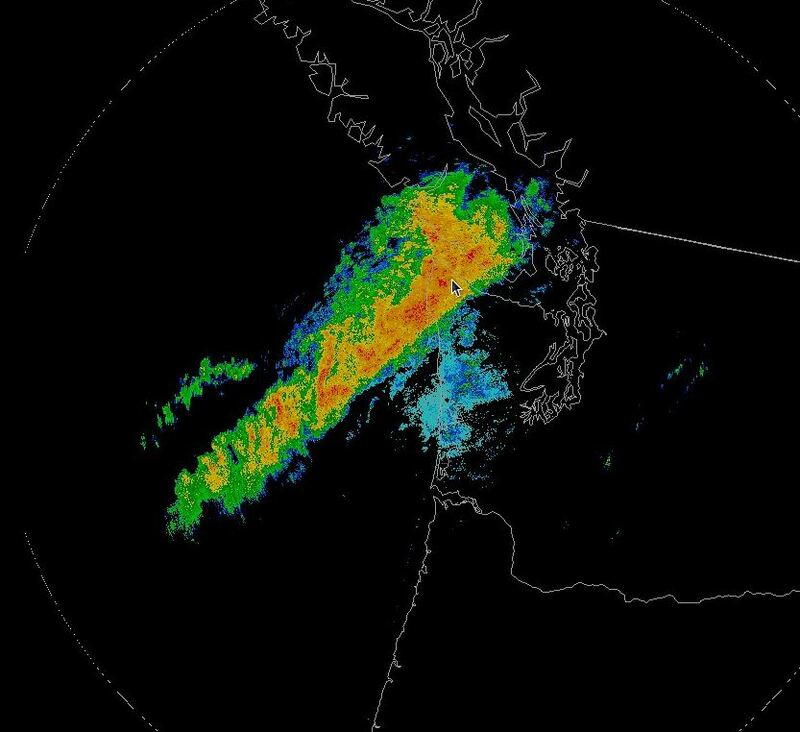 Here’s Portland’s radar view, partially blocked as always by the Coast Range: Notice the line of rain way out there appears quite weak. Then check out the view from the new radar about two hours ago! Wow…looks much more impressive doesn’t it? Can’t wait for it to be operational during the upcoming winter. Today is the Day; The Heat Is On! Everything has fallen into place this morning for our first 90 degree (or plus) day in the interior of Western Oregon and parts of Western Washington too. Skies are clear, and the atmosphere has warmed dramatically the past 12-24 hours. The 5am weather balloon over Salem recorded a +19 degrees C at 850mb (near 5,000), and a northeast wind at 20 kts at 1,800′ elevation. That north to northeast flow extends from just under 10,000′ to almost the surface. So we have offshore flow in progress and a very warm air mass overhead. That’ll give you 90+ just about any day between late May and early September. The +19 over Salem is actually a bit warmer than modeled too. So we may end up with +20 or +21 this afternoon. The Crown Point wind sensor at Vista House had an east wind gust to 21 mph at 8am. Not huge offshore flow, but the best of the summer! Expect a quick warmup between now and noon as the warmer air surfaces and the downslope warming kicks in. The heat doesn’t stick around long, although tonight will be a very warm one for late August. Urban areas will remain at or above 60 degrees. We have something else interesting on the way Monday and Tuesday. A very wet system, an “atmospheric river” is going to sit over Vancouver Island later tomorrow through early Tuesday. This contains tropical moisture and will dump a ton of rain up there. Rain may get as close as a line from Hoquiam to Olympia. Note the 72 hour rainfall total from the UW-WRF model. This isn’t the usual North Pacific cold front either. Precipitable Water (measure of total moisture in the column of air overhead) is going through the roof. I see the NAM has it up to 1.60″ over Seattle with an 850mb temp still around +12 later Monday! That system basically spends Monday-Wednesday dying over the Washington Coastal waters and Southern British Columbia. So we get a ton of moisture on our doorstep and very little wind from any direction after today. This is a setup for unusually humid weather and warm nights next week. In fact that’s how I noticed it…MOS model temperatures show quite warm nights much of next week for the last week of August, so I went poking around to see why. If the surface wind turns northwest or northerly after Monday, we’ll just be importing that humid air mass from the rain-soaked ground up north even if we are sunny. I think this happened during the hot spell two, or three years ago? I can’t remember the exact setup or which warm spell it was, but I remember Cliff Mass posting something about it. I’m on vacation and don’t want to do that much work looking for it, maybe one of you could find it? You are currently browsing the FOX 12 Weather Blog blog archives for August, 2011.